Common relatives include Grevillea, Leucodendron, Leucospermum and Banksia. Numerous flowers in dome-shaped heads, 12 inches across, surrounded by stiff colored bracts, giving a crown-like appearance. 32-34 F, provide light during storage to prevent leaf blackening. Use fresh flower foods before storage also to reduce/prevent leaf blackening. Named after Proteus, a Greek sea god with the power of prophecy. The species name of cynaroides refers to the plant’s resemblance to artichoke whose Latin name is Cynara. 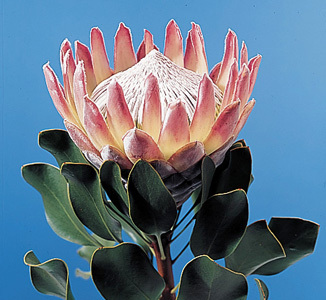 In 1976, the King Protea (P. cynaroides) was designated the national flower of South Africa. Need very little care in the landscape. King types can grow as large as 3-4 feet tall with flowers 8-10 inches in diameter with white centers. Pink Ice is one of the most popular cultivars.